At the dawn of Prohibition, Nucky Thompson and his protege, Jimmy Darmody, set out to conquor Atlantic City. Jimmy finds out being more than half a gangster involves paying a lot of money to the man on top. Nucky’s on the hook to Rothstein for $100K, and Jimmy and Al’s cleanup in the woods wasn’t quite as thorough as they both thought. Everyone learns something this week, even us! Jimmy learns it’s best to make sure all witnesses to a massacre are dead; Van Alden learns some choice words in Yiddish; and Nucky’s new partner learns bootlegging is a dangerous business. Nucky throws himself a surprise party, but doesn’t get the present he wants. Jimmy practices being a gangster in Chicago, with somewhat disastrous results. Margaret loses herself in a fairy tale and dabbles in shoplifting. It’s St. Patrick’s Day, Nucky’s least-favorite holiday, and he’s got plenty to deal with this year, what with Margaret ratting him out to Van Alden, Eli wanting to make a speech, and the leprechauns ready to go on strike. Poor guy can’t catch a break. Nucky sets Margaret up in a fancy house as his new mistress; Jimmy helps Torrio take out Sheridan and conquor Greektown; Al shows his softer side (kind of). Nucky reveals the secrets of his horrible childhood to Margaret; Jimmy takes a fellow war vet under his wing (and gets revenge for Pearl), and Angela indulges in a Sapphic love affair. Nucky heads to Chicago for the Republican National Convention and helps get Warren Harding nominated (something the country will not thank him for in years to come). Back home, Eli’s in charge, and gets himself shot during the D’Alessio brothers’ casino heist. Nucky starts prepping for war, asks Jimmy to come back to AC, and has Margaret stash some important papers. Things are heating up. Things get done in quiet one-on-one conversations this week. Jimmy returns and Nucky asks him to kill the D’Alessio brothers, who are now in league with Rothstein. Before he can get to that, Van Alden arrests him and commences a crazed line of questions that boils down to: Is Nucky banging Margaret? Margaret gets Nucky to cut Mme Jeunet a break on rent and, in return, shakes down Mme for a fancy new dress. There’s some political wheeling and dealing, the Commodore gets involved, and gunshots erupt on the boardwalk. It’s summer in Atlantic City, folks! There’s a lot of growing up done this episode. Al finally sets aside childish things and starts acting like a man; Margaret comes into her own, politically; and Nucky, Jimmy, and Chalky mature further as gangsters. In other news, Two Face almost makes me cry. In the penultimate episode of season 1, we get lots of fights and a few breakups. Also, the Commodore’s being poisoned, Two Face reveals his inner psycho for a moment, and Van Alden kills his partner. Seriously. Some characters share hard truths about their pasts, and a whole lot of them pay the price for their actions. Welcome to the final episode of season one, folks! It’s a bloody one. …he’d probably go right home again. Eli, Jimmy and the Commodore set the Klan against Chalky, which predictably results in a bloodbath and a whole host of problems for Nucky to deal with. On the home front, he’s also dealing with Margaret’s son, who’s discovering a fascination with fire. Mrs. Van Alden comes for a weekend visit and gets turned on for perhaps the first time in her life when she gets to see her husband in action. She does not get to see him shacked up with his very pregnant one night stand, however, which is probably for the best, for now. Nucky gets bailed out in time to celebrate Valentine’s Day, but things aren’t looking too good for him. He does at least figure out who his friends and enemies are, though, and realizes Margaret’s even more on his side than he thought. Chalky enjoys jailtime with a complete tool, and Jimmy heads north to try and do business with Rothstein. Margaret does a little digging into her own family, and it doesn’t go terribly well. Lucy’s going so stir-crazy she’s actually suicidal, but Van Alden unexpectedly steps up for her. Things are still looking bad for Nucky, but Sleater offers to be his hitman/muscle, and it looks like he’s going to be a valuable addition to the team. The Commodore suffers a stroke, putting him out of commission and Jimmy in charge. Both Jimmy and Nucky are pursuing business relationships in Philadelphia, and Two Face is pursuing a friendship (or perhaps more) with Angela. Van Alden’s two deputies start to suspect something’s not quite right with him. Jimmy asserts himself in the most gruesome way possible, while Eli tries crawling back to Nucky and then disastrously loses his temper with a ward boss. Two Face nearly eliminates himself from the show’s cast, but he’s saved by a dog and some woodsmen, who somehow convince him to keep living. Rattled by his deputy’s terrible injuries, Van Alden considers confessing his sins while unbeknownst to him, Lucy’s in labor at home. Margaret also has to face her sins and admits to her priest that she’s got a bit of a crush on Sleater. Jimmy finds out about Nucky’s dealings in Philadelphia, resulting in yet another showdown in the woods. Margaret finally screws up the courage to go visit her family and isn’t welcomed with open arms. You know who does welcome her with open arms? Sleater, who also kills a guy for some reason I don’t think was really well explained. Jimmy allows himself to get bullied into ordering a hit on Nucky, which fails, and Lucy decides she’s had enough of this parenthood thing. The death of his father makes Nucky realize that life’s too short to deal with people who want to shoot you, so he decides to retire. Or does he? Jimmy has a depressing heart-to-heart with Angela before drunkenly celebrating what he thinks is his final victory, and he moves just a bit further into crazy psycho land. Margaret tries to buy a miracle for her daughter, which goes as well as you’d expect. Nucky and Sleater flood AC with cheap, high-grade whiskey, totally undercutting Jimmy and his cohort and sending them out of town to sell their hooch. Jimmy’s many mistakes come home to roost in a very big way. In the aftermath of Angela’s death, we get confirmation that Jimmy’s and Gillian’s relationship is completely, horrifically inappropriate (as if we needed it). Nucky’s facing a jail sentence, until someone comes forward to discredit Van Alden. Unfortunately, Margaret’s guilt might just drive her to testify against him instead. Season 2 ends–quite literally–with a bang after Eli and Jimmy try to get back on Nucky’s good side and Nucky manages to escape prosecution. There’s even a wedding! Nucky spends the episode in New York City, meeting his odd new government go-between and being jealous about his girlfriend. Far more interesting is the action down south, where Eli is released from prison and put in the employ of Mickey Doyle and Gyp Rosetti gets revenge for being cut out of Nucky’s liquor trade. Nucky’s trying to get the Gyp situation under control by sending his convoys to New York via the back roads, but Mickey ignores his orders and gets a whole lot of men killed. Nucky spends most of the episode hiding in a flooded basement with Sleater and some kid they’re trying to kill for stealing from them. In Chicago, Al takes on a bully murderously. Everyone celebrates Easter with various loved ones–Nucky and Margaret with Eli and his family, Gyp and his womenfolk, TF and Julia and her drunken dad, and Gillian with Replacement Jimmy. Some people move closer together, and one winds up dead. Van Alden gets into the illegal hooch business, Nucky tries to get into business with Andrew Mellon, and Billie’s career takes off just before she gets blown to kingdom come, along with Babette’s. Nucky tries to hold it together, recover from the explosion, and get all the other bootleggers behind him to go to war with Masseria. None of these things go particularly well. Owen’s and Margaret’s plan to run away hits a significant snag, as does Nucky’s first move against Masseria. Van Alden’s attempt to be a booze peddler runs him afoul of Al in Chicago, but the important news is: Two Face gets laid! Nucky and Gyp go to war, and while it’s bloody, it doesn’t really seem like anyone’s winning. Time for Nucky to do what he does best: play people. We finally get this season’s big bad, and I think he’s going to be a billion times better than last season’s, mostly because he’s not insane and is played by Jeffrey Wright. Eddie wants to start getting a little respect, and Two Face is losing his edge. Nucky explores a land deal in Florida while Eli’s kid Will explores romance in Pennsylvania. Richard’s sister saves his life, and Narcisse makes a proposal to Dunn. Rothstein’s in ‘a slum’ as Meyer so politely puts it, which basically means he’s losing at everything, including being in on the Tampa land deal with Nucky. Meyer buys in instead. Eddie parties with a Capone, while back in Chicago Al and his other brother recruit Van Alden. Oh, and Will accidentally kills one of his classmates. Ding, dong Van Alden’s lost his mind! Get Richard to the judge on time! 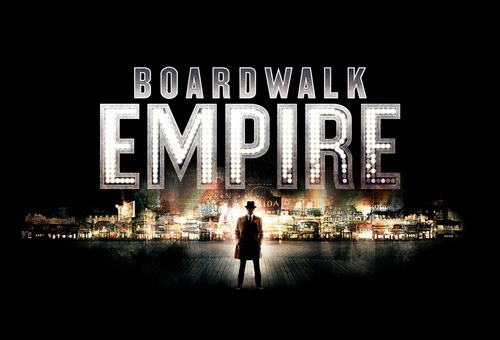 The show’s final season kicks off by both moving forward seven years and back 40 so we can watch Nucky prepare for a world without Prohibition and get his start on the Boardwalk before there even was a Boardwalk. In other news, Margaret gets traumatised, and Lucky makes a significant move. Lucky tries to recruit an increasingly unstable Al as a business associate and reveals Van Alden’s Prohie past. Nucky and Margaret spend the day together and Sally ends her day by getting shot.